The team behind Diwali 2007a��s Billa is back. a�?a�?There are no two ways about it, this film is special because it is a Thala (Ajitha��s moniker) film. Just like we celebrated all his other films, I am expecting the same for Arrambam as well,a��a�� says director Vishnuvardan. The classic good vs evil tale has other big names on board a�� Yuvan Shakar Raja, Omprakash as DOP and editor Sreekar Prasad. The directora��s wife, Anu Vardan, is doing the costumes. It was initially not meant to be such a huge star cast, he says.a�?a�?Arya came on board as we needed an equally important hero opposite Ajith. Arya, being one of my best friends helped me out,a��a�� he says. Nayanthara and Tapsee Punnu play their love interests. Mahesh Manjerakar and Atul Kulkarni essay key roles with a special appearance from Rana Duggubati. Winning card: Vishnuvardan has roped in fight choreographers like Vishwaroopama��s Lee Witcher to choreograph a stylish boat chase, Kchi from Thailand, Tinu Verma from Bollywood and Jagan from Chennai. This Karthi starrer is almost as good as Ajitha��s film, say industry sources. a�?a�?Karthia��s 80a��s getup and Santhanama��s female look are the high points. Ita��s a comedy like all my previous films,a��a�� says Rajesh. Kajal Aggarwal is paired opposite Karthi in the film shot extensively in Pollachi. Winning card: What works in their favour are Studio Green, one of the biggest production houses, Karthia��s impressive fan following among the youth and director M Rajesha��s track record at the box office. Trivia: All in All Azhaguraja is named after Goundamania��s character in the 1984 film, Vaidehi Kaathirundhal. Winning card: The cinematography is by Ravi Varman. Trivia: Reportedly, `6 crore was spent on Priyanka Cho-praa��s song. The sci-fi thriller sees the superhero who rocked Koi Mil Gaya and Krrish. And Hrithik Roshan has company in the form of superwoman, Kangna Ranaut. Priyanka Chopra plays his love interest. a�?a�?It was one of the most physically challenging roles I ever did. The action was very raw. We had stunt masters from China,a��a�� says Ranaut. Viveik Oberoi appears as the villain, Kaal. a�?a�?Playing a bad man is exciting. A lot of homework went into my character,a��a�� he says. Winning card: As expected, the stunts have surpassed all the other Krrish movies and Ranauta��s edgy look in the promos has been well received. 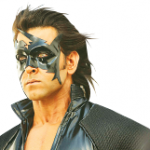 Trivia: Over 600-700 masks, each worth `8,000, were made for Hrithik for the film. The film is repo-rtedly being released across 5,000 screens worldwide.